2015 is going to be an amazing year for ANIMATION. 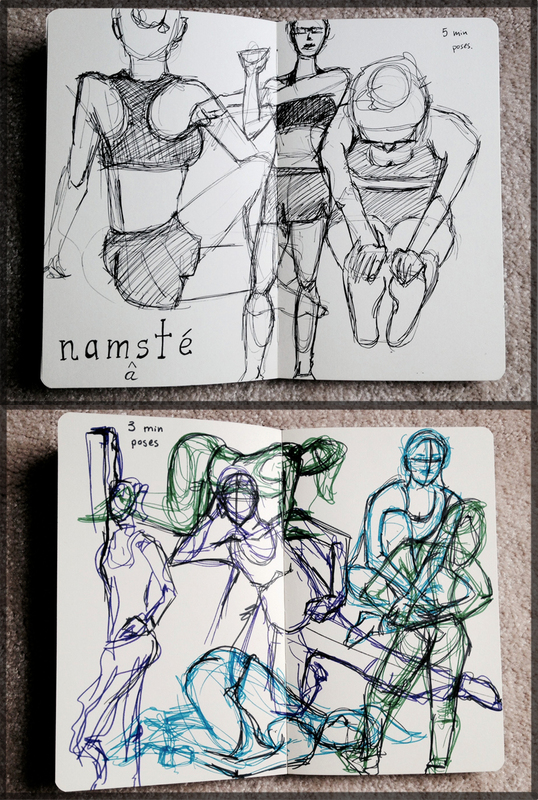 This is a quick snapshot of two pages from my sketchbook: one page includes 5 min poses with pen and the other 3 min poses with markers. 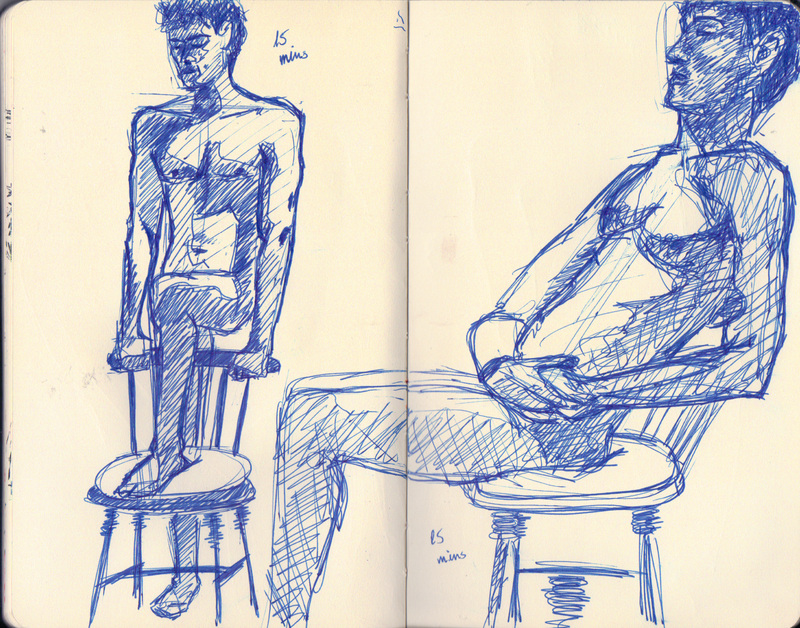 It’s been about 3 years since I have seriously and consistently practiced life drawing…. And boy, does it show in my art! Many people assume that drawing skills are rooted in talent (therefore unrelated to practice). That could not be further from the truth… ART IS PRACTICE. ART IS TECHNIQUE. ART IS CONSISTENT CREATIVITY. Speaking of practice, these poses were inspired by the recent yoga classes I have been attending. Yoga is consistently referred to as an individual ‘practice.’ Sometimes, the classes can have a religious feel with the ‘namasté’ pray at the end (but rest assured it’s more mental and physical exercise than spiritual). Today, our teacher kept referring to the neck as “an extension of the spine,” which reminded me of the principles behind gesture poses in life drawing classes. (Gesture poses are more about capturing the energy of the pose than the actual proportions and details.) Yoga teachers also love to say “Check in with your body today… Listen to your body.” In much the same way, figure drawing is about checking in with the model’s posture, attitude, pain, physique, and form for THAT MOMENT. Too many people draw what they think they see rather than what they ACTUALLY see. Both yoga and figure drawing requires checking in with the body constantly to re-alight the physical level. After the power vinyasa class, I was extremely motivated to sketch… Plus, my sister is just SO photographic (aka draw-able). This dissertation is situates within the growing research around the stylistic use of digital technology and new media in contemporary cinema. My main area of investigation will be the virtual camera in narrative computer-animated films, with a precise interest in musical cinematography. The term ‘musical’ refers to the narrative premise of analysing song or dance sequences, while the term ‘cinematography’ refers to the stylistic and aesthetic form of the camerawork. The musical context provides a point of consistency across the films and sequences chosen for formal analysis, thereby providing a lineage between different production methods and styles. Prince argues that that digital technology builds “on stylistic traditions established by filmmakers in earlier generations … while providing new and more powerful tools to accomplish these ends.” Likewise this dissertation will explore the stylistic developments in computer-animated films in relation to past cinematic traditions. This investigation is structured around the aim of outlining and testing the term ‘digital cine-mobility,’ as a cinematic style, through comparisons with established stylistic traditions. Chapter One will explore the visual effects of cel-animation and computer-animation in relation to the Walt Disney Animation Studio. Chapter Two will study the moving camera of the American film musical. And finally, Chapter Three will scrutinize the term ‘digital cine-mobility,’ which we will initially define as, the selection of fantastical, playful, and impossible camera movements in computer-animated films. The concept of digital cine-mobility is framed around a lively camera that presents spatially dynamic, effortlessly integrated, and kinetically expressive movements. The aim of this investigation is to progressively examine, and attempt to define, the descriptive terms above. Stephen Prince, Digital Visual Effects in Cinema: The Seduction of Reality (New Brunswick, New Jersey, and London: Rutgers University Press, 2012), 4-5. When was the last time you paid attention to the cinematography of an ANIMATED film? Can we please take a moment to honour the framing, colour, lighting, and design of shots in Miyazaki animation? His animated films are visually beautiful and a nice stylistic difference from the traditional western aesthetics. Note to Self: the cinema of Asia is artistically exceptional and I should watch international films more often.